You work hard to keep your lawn healthy and green. You care for it throughout the year. You mow your lawn, rake leaves and even invest in lawn care services to ensure that your soil is correctly balanced, and that your grass has the right foundation of fertilizer to stay healthy and thick. However, all that hard work can be undone by one single invasive species – crabgrass. What starts out looking innocent enough quickly turns into a nightmare as it spreads throughout your yard, killing off your turfgrass and creating an ugly mess. Thankfully, there are several ways you can easily kill crabgrass, including the products listed below. One of the most effective options on the market, Drive XLR8 kills crabgrass and does it quickly. A single 64-ounce bottle contains enough liquid to treat an entire acre when used at the specified application rate. It dries in less than an hour, and once dried, it won’t wash off, which means that even rainstorms can’t stop your crabgrass eradication efforts. In addition to crabgrass, this product is also capable of killing many other lawn weeds. QuinKill Max his a liquid crabgrass preventer and also controls the spread of other weeds like foxtail, bindweed and dandelion to name just a few. Just one pint of this treatment can cover up to 10,000 square feet with a gallon controlling weeds in a full acre. One of the most commonly used products to kill crabgrass easily is Scotts Halts Crabgrass Treatment. While the manufacture insists that it can be applied in spring, or the fall; it is better to apply it in the spring in Cleveland and Columbus. Like many other Scotts products, Halts is designed to be distributed with a spreader (it comes in bags of granules). If you decide to use this product; be careful, as one bag will only treat 5,000 square feet. The product Dimension is one of the most effective ways to kill crabgrass easily, and is the majority of professional lawn care companies in Cleveland and Columbus use. It’s a pre-emergent designed for application in spring to control crabgrass and other grass-type weeds. Its slow-release formulation ensures that it controls for a long time, and it’s also rich in potassium, which builds healthier soil, providing you with better lawn growth over the course of a year. Unlike the other products that are mentioned above, Dimension is designed with professionals in mind and is often only sold in professional wholesale locations such as John Deere Landscapes. OR... How About Letting the Professionals Handle It? Crabgrass is a very unique weed that is a major problem in Cleveland and Columbus lawns during the late spring. If you’ve struggled with your yard and have been unable to eradicate your infestation though, there’s nothing wrong with seeking some professional assistance. At Weed Pro, that’s what we do. Our specialty is handling weeds and unwanted growth in our customers’ yard, while providing the highest caliber lawn care services in Ohio. Our representatives can give you a hassle-free quote on a lawn care program that includes crabgrass prevention. 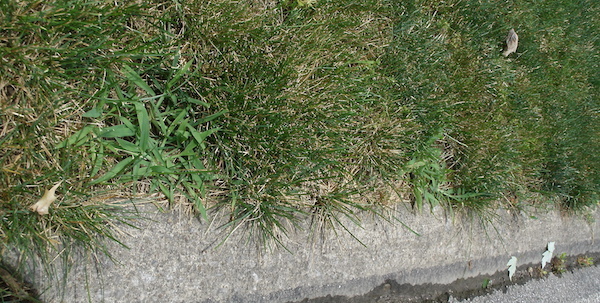 Crabgrass is just one of the problems you'll run into this spring while caring for your lawn. That's why we've put together the ultimate lawn care guide to help you care for your lawn. Download it for free by clicking on the button below!